Colorful designs that are fascinating and attractive! Go wild in these Wild Print padded tights! No one will miss seeing you with these bright colors and patterns. These tights offer peak performance so that once you have them on, they’re like a second skin. These tights have the highest quality fabric and workmanship. The tights are 80% Nylon, 20% Spandex for all-way stretch and can endure the rigors of cycling. The materials give a light compression to support moving muscles and provide an abrasion-free bike ride. 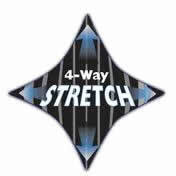 The waist is a light one inch elastic that is coverstitched for maximum stretch-ability.???? All the seams are flatlock stitched with 5 threads for durability and compression support of working leg muscles. 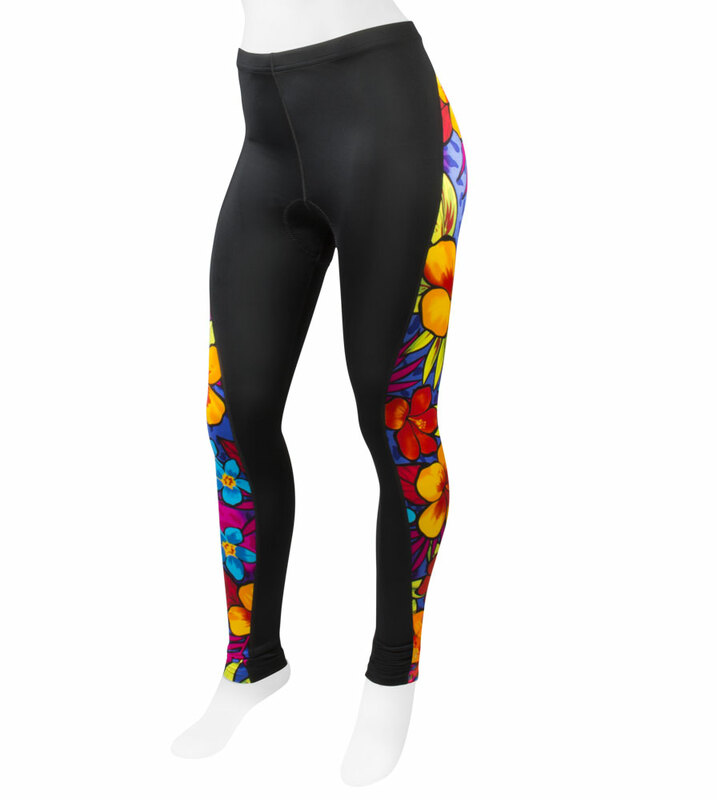 The inner leg is smooth and seamless reducing abrasion and saddle sores from the chafe during bike rides. The tights use our Top Shelf chamois so you can Ride Longer and Feel Stronger. 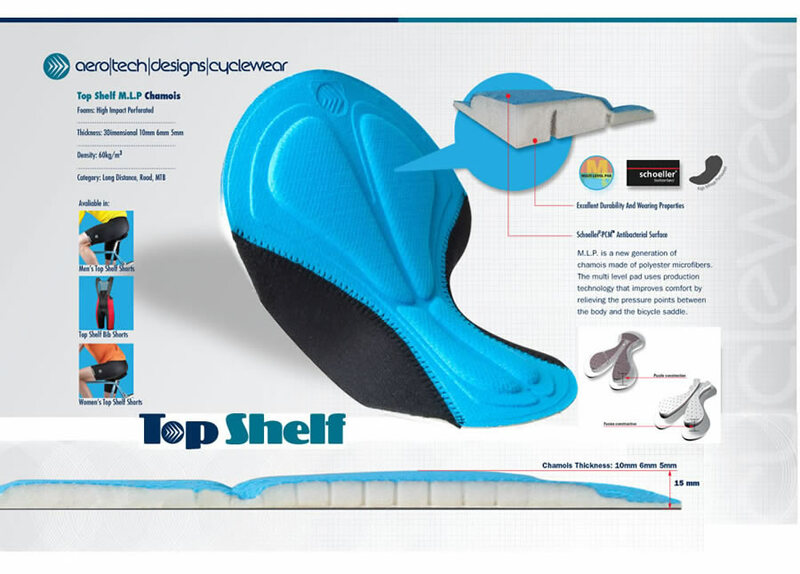 Top Shelf pad is an anatomically designed pad for the bike riding position. It uses multi-level production technology to improve comfort by relieving the pressure points between the body and the bicycle saddle. It is a fantastic fit that comes from a highly engineered design that fits all the curves between the legs and around the body's pelvic area. The side wings on this pad offer up excellent fit around your legs and torso. The surface of the chamois is antibacterial which is important to prevent the growth of bacterial which lead to saddle sores for long distance cyclists. The Tropical print is reminiscent of an island paradise, lush and vibrant. It will liven up any bike ride! Side panels are sublimation printed in our own shop with environmentally friendly inks that bring out brilliant color on domestically-knitted fabrics. These colors will not fade! This brightly colored garment is best enjoyed outside in the wild outdoors. 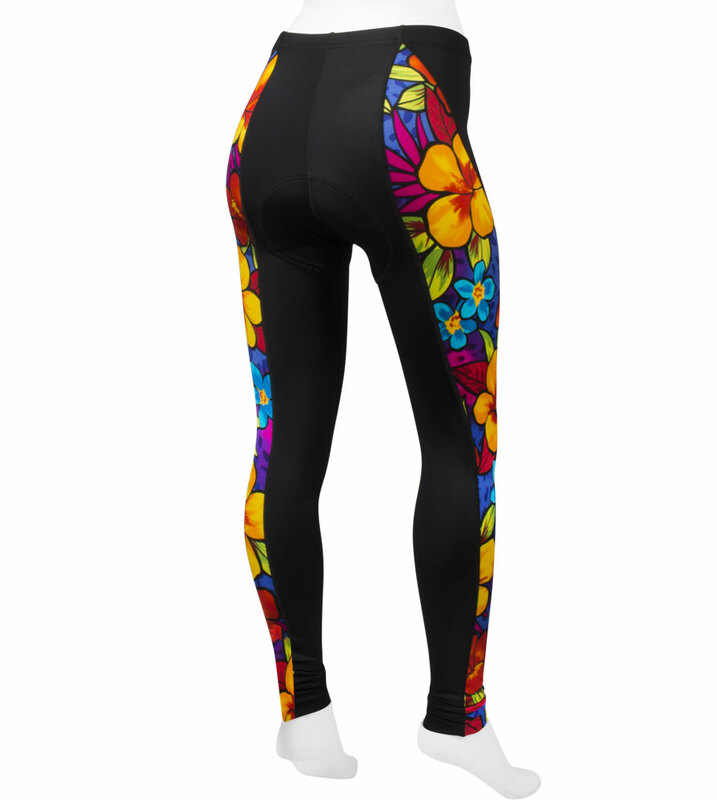 This item is fantastic, with the high waist detail they never feel uncomfortable and allow full movement in classes. I like wild and crazy stuff! I wore the leggings over my ATD bike shorts because it was a cool and windy ride. I liked them a lot they rode well. They are a little long on me, I am 5 31/2, but because they are fitted at the ankle it was no big deal. Great unique product. I use these for biking and the gym. Company is great also. I initially ordered a size larger since usually tights are too tight. These were too big and your company was great about a simple exchange. Thanks. I'll be back for more.